Last week I discovered that there’s an annual sci-fi film festival on in London, so naturally I had to book a few tickets for the weekend. My choice for the Saturday evening was Hunter Prey, the first feature film from Sandy Collora (who also directed the pretty nifty high budget fanfilm Batman: Dead End). Being lured in by the trailer’s promise of gunfights, aliens and faux-Stormtroopers, I expected a jolly action romp. I think that’s pretty much what I got, but with a little extra on top. I arrived at the Apollo Piccadilly in the pouring rain, slightly worse for wear. After dicking around on the Starcraft 2 beta for a quarter of an hour (in summary: it looks rather fun and would probably melt my antiquated computer) I sat down for the film. Before we got going with the main feature, they showed a short film from the Israeli film student Dan Sachar called When it Will Be Silent. It’s seven minutes long, has no dialogue and only two actors and it made a lump in my throat. It’s very much in the style of Cormac McCarthy’s The Road, a book that managed to not so much pull at but yank my heartstrings right out. Sachar has kindly uploaded it to the web, so you should go watch it. Anyway, back to Hunter Prey. I admit that this is quite a hard film to review without spoiling major plot twists, but I’ll try my best. The film hurls the viewer straight into the action, with a crashed spaceship on an anonymous planet and a group of surviving commandoes trying to subdue an escaped prisoner. So far, so good. The following ninety minutes complicate matters slightly. The main protagonist changes around half-way through, the underlying plot is revealed bit-by-bit and then suddenly confused with the addition of new threads. There’s a rather silly deus ex machina towards the latter third and then some strange under-explained developments at the end. We’re left with a cliffhanger, though a fairly satisfying one. The characterisation is probably one of the film’s finer points. We gradually learn more about the nature of the main protagonists over the course of the film and in fact it comes as quite a surprise when one of them is killed off fairly early. The growing relationship between the commando Centarui 7 and the A.I. Clea was particularly interesting and allowed for moments of respite in-between the fights. The visuals also deserve praise. 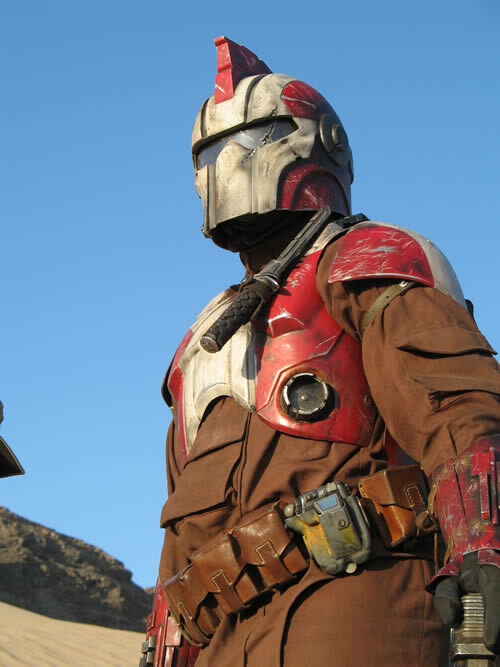 Between the desert vistas reminiscent of Tatooine and the grimy Boba Fett armour, Hunter Prey really shows the influence of early Star Wars (which Collara admits was one of his inspirations). With probably less than twenty minutes of CGI in the entire film (which is for the best, as it isn’t exactly the nicest I’ve seen so far), it has a real authentic charm to it that newer sci-fi films often seem to lack. Of course it isn’t all perfect. The plot could use a bit of tweaking – as mentioned before, there are some egregious examples of deus ex machina. Also, the dialogue can be cheesy at times. The inspired beginning succumbs to a few clichés by the end, sadly. Overall, I’d say that Hunter Prey feels like a short story from an anthology. Not to say that it’s overly-long; none of the ninety minutes really felt wasted. It’s just part of a greater narrative (as Collora says, “like the approach Jim Cameron took with “The Terminator“, [Hunter Prey] is a very small piece of a much larger picture”) that could be explored in greater depth with other films – perhaps not even direct sequels, but just in-universe explorations would be good. As a director’s first feature film, Hunter Prey is pretty damn good, especially considering the shoestring budget which Collora had to work with. As a sci-fi film, it’s a little brainless – certainly, it’s nothing groundbreaking – but nevertheless it’s still good fun. It’s unashamed of its homage to the classic sci-fi of the 70s and it captures some of the atmosphere of those old films. I expect good things to come from Sandy Collora. This entry was posted in Film, Review and tagged hunter prey, review, sci-fi, sci-fi london, when will it be silent. Bookmark the permalink.